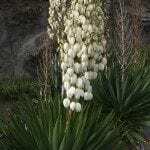 I have a very large yucca tree in my garden. During last winter it suffered some snow damage at the top and part of it died, which I have since removed. It has now produced very many new shoots from the trunk, some have grown a foot long, and I am wondering if it is possible to remove these new plants from the trunk and plant them up. If it is possible, please can you advise me how to proceed?